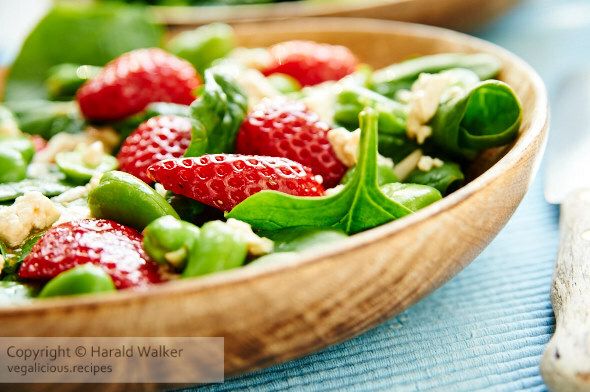 Strawberries and spinach are a very nice pairing for salads. The fava beans add a lovely nutty flavor as well as a great green color. Remove the fava beans from their pods. Bring a pot of water to boil and put the beans in. Allow them to cook, just until the begin to float. Then directly plunge them into cold water to stop the cooking process. Remove the outer skin of the favas to reveal the tasty bright green bean. Make the dressing by combining the vinegar, oil, salt and pepper, herbs and a pinch of sugar. Season to taste. Clean and spin dry the spinach leaves. Mix the spinach and mint leaves together and arrange as a bed on individual salad plates. Lay a few strawberry halves on top of the spinach and mint. Add the favas around on top also. Sprinkle the tofu feta and almonds or pine nuts on top. You can make “tofu feta” by cutting the tofu in very small pieces. Then soaking it in a brine of salt, miso Italian herbs a bit of vinegar and water overnight. Inspired by Amanida de faves tendres i maduixes from cuinaperllaminers.com. Posted by Chris Walker on April 19, 2010 in Almond, Beans, Salads, Spinach, Strawberries, Tofu.